An innovative Angus 3D printing start-up is set to help deliver cost savings to the oil and gas sector and up to £1 billion of benefits to the economy of North-East Scotland by bringing cutting-edge F1 technology to Scotland for the first time thanks to a £175,000 grant from Zero Waste Scotland. In 2017, Brechin-based manufacturing expert Andy Simpson was invited to make a presentation to Zero Waste Scotland and CEED on how additive manufacturing can aid the circular economy. 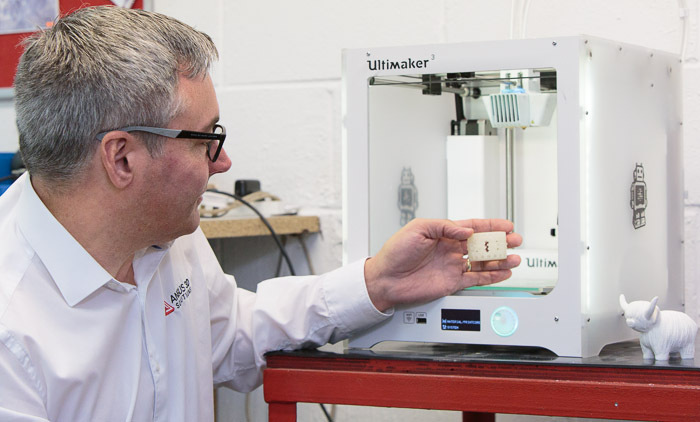 He explained that this can be done by reducing waste in the design process and extending the lifespan of machinery by allowing obsolete parts to be manufactured from 3D scans – cheaper, faster and using less input materials than traditional manufacturing. Zero Waste Scotland was so impressed that it invited Simpson to apply for a grant from its Circular Economy Investment Fund – part of the Resource Efficient Circular Economy Accelerator Programme, supported by the Scottish Government and the European Regional Development Fund — to buy the highly advanced metal printing machine, the Markforged Metal X. The fund provides funding and support for SMEs in Scotland to be more resource-efficient and create a more circular economy. The machine uses the latest Atomic Diffusion Additive Manufacturing (ADAM) technology – where metal powders are encased in plastic binders that are then melted off – to create objects with unprecedented levels of detail as well as faster than ever. It’s believed the only machine in the UK to date owned by a Formula One team and universities. None are available for external commercial use. The machine, expected to arrive at the Brechin start-up in December 2018, will be used to make new components for industries as diverse as oil and gas, medical and satellites and in the reverse engineering of obsolete parts. It’s expected to help the business gain new clients as well as aid the growth of the circular economy in Scottish manufacturing. A circular economy is a greener alternative to the traditional linear economy – where we make, use and dispose of items — in which we keep precious resources in use for as long as possible. The benefits include: creating opportunities for growth; reducing manufacturing waste; higher resource productivity; a more competitive economy; reducing the environmental impacts of production and consumption and positioning Scotland better to address emerging global resource security and scarcity. Angus 3D Solutions’ grant is one of three cited by First Minister Nicola Sturgeon as being part of a programme that could unlock up to £1 billion potential value in the economies of Aberdeen, Aberdeenshire and Tayside by boosting the circular economy according to reports commissioned by Zero Waste Scotland written by independent consultants with the help of the local chambers of commerce. Speaking at the Zero Waste Scotland Circular Economy Hotspot Scotland event, Sturgeon said: “These reports show the exciting potential of a circular economy where reducing waste and investing in keeping materials in circulation for as long as possible can release an estimated £1 billion of economic opportunities for Tayside, Aberdeen and Aberdeenshire. This demonstrates the overall scale of the opportunity for Scotland. “It’s great to see projects like Total Homes, Revive Eco and Angus 3D embracing our circular economy and getting maximum value from resources. This £700,000 investment will help these businesses re-use and repurpose products that will benefit communities by creating jobs and reducing emissions. Speaking about the grant win and its consequences, Andy Simpson, who’s based at Brechin Business Centre, said: “I’m naturally delighted we’ve received this funding award from Zero Waste Scotland, because it will help our clients and the Scottish manufacturing industry develop their circular economy. Scotland has an impressive manufacturing history. To maintain and further develop this we must embrace the latest additive manufacturing technology and making it accessible, and therefore encourage the next generation to look at manufacturing as a career choice. We can do this by bringing the latest additive manufacturing technology to Scotland and making it accessible to all industries and individuals. This grant will enable that.